The worst thing about coming home from holiday is that after a long journey, you can't just relax. There's no food in the house, and there's a mountain of unpacking, washing and ironing to be done. In my case, I have to also write an eye-wateringly huge cheque to the local doggery to get my pooches back (two weeks = £408!!). And then there's the post-holiday diet that needs to be addressed too. Tea on the last night of holiday (ie the day we come home) is traditionally Chinese takeaway and I honestly wanted nothing else when we got in. But I have a blog that needs a new recipe so I went with a simple spaghetti carbonara. 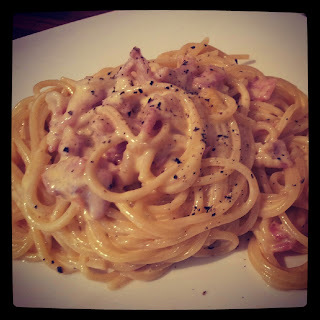 It's something that I've only ever made the husband once, back when he was still boyfriend (if that's the correct term for a 37-year-old) and that was using a tub of fresh sauce from Sainslebobs which I then proceeded to add more ham and cheese to and it still tasted vile. It was a shame, because he basically lives on ham and cheese sandwiches so it seemed like a perfect addition to his limited eating repetoire. I never thought about making it from scratch again until a fit of desperation when looking for simple, family friendly recipes for our holiday eating. I was therefore sold on this recipe for two reasons. #1 I could pick up the ingredients in an M&S Simply Food on the motorway services on the way home when we stopped for Miss A's babyccino fix. #2 It had 'Dead Good' in the title, which is usually the sign of a winning recipe from Olive Magazine. And, as a bonus, it used white wine which meant there was a welcome spare glass at the end of cooking. Really simple, everyone liked it. Just a shame that it's so fattening - a whopping 900 cals per serving, excluding garlic bread and wine - so it's definitely off the menu for the foreseeable future.